TIG Hotwire is a further development of mechanised TIG, where high deposition rates are achieved in combination with the first class quality traditionally expected from TIG processes. The essential element is resistance preheating of the consumable, spooled wire wich is continously added to the melted pool. The TIG arc is fusing the base material as usual, while a much smaler part of the arc energy is requied to melt the wire then in traditional TIG. This because the wire is allready heated close to it’s melting temprature. Deposition rate therefore increases, and fewer runs are required to fill the joint. 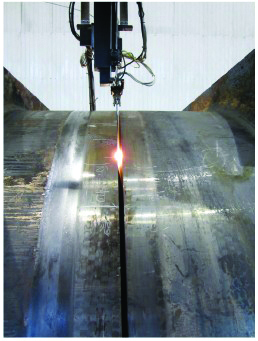 Welmax has developed and for some years supplied special equipment for orbital Hot Wire TIG welding of pipe, using a narrow gap joint preparation to further improve the efficiency. The equipment is based on a standard Esab ProTig power source assisted by a Welmax designed power source for resistance heating of wire and a specially designed welding ”bug” with TIG + Hot Wire welding head. A welding station consists of one or two welding bugs with power source and wire feeder, depending upon pipe diameter. Two bugs may run on one common girth rail. The process / equipment competes primarily with other solutions for orbital pipe line welding, but also in prefab of pipe to pipe and pipe to fitting, when set up as a production line with fixed stations. A number of stations including also joint preparation units and auxiliaries have been supplied to Aker Kværner Malaysia and Aker Kværner Brazil in 2007 – 2008 for riser fabrication lines. Welmax technicians have assisted during the first months of fabrication. Piping Fabrications for modules construction.